When I first saw the black hole gear, I was pretty damn disappointed. Some items were an upgrade, a SLIGHT upgrade, over my Rakata stuff. But in most cases I’d actually LOSE a hefty chunk of strength. No. Way. 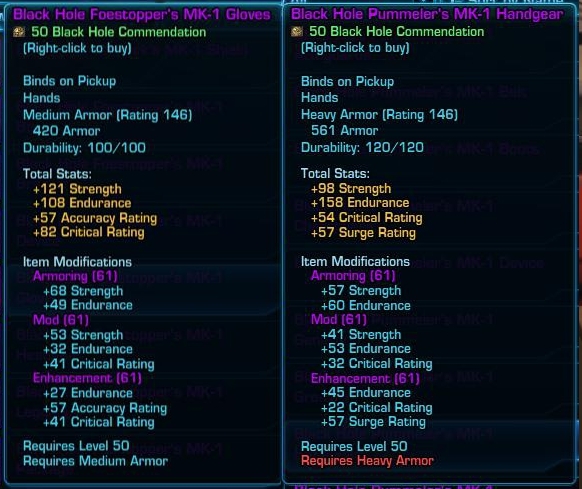 Whilst perusing the black hole stuff over the weekend, trying to see if I was mistaken about the total suckitude, I noticed that the heavy armor DPS set’s chestpiece had significantly better-itemized stats for my class. Well, as everyone knows, you can just strip the hell out of the mods etc and plop em in a medium armor shell. HAHA, I thought, I will just buy the heavy armor set. But no! 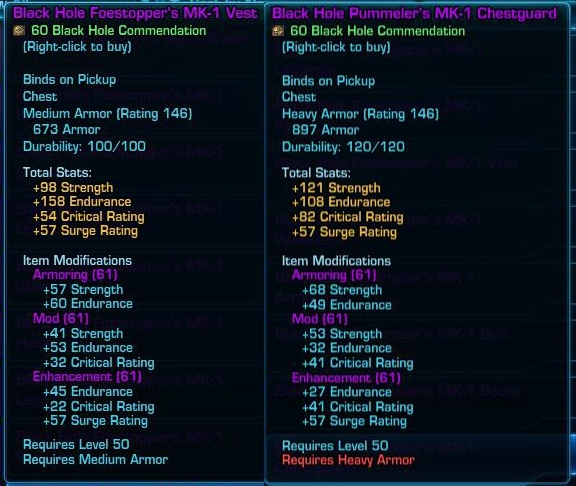 Some of the medium armor items are better than their heavy armor counterparts. 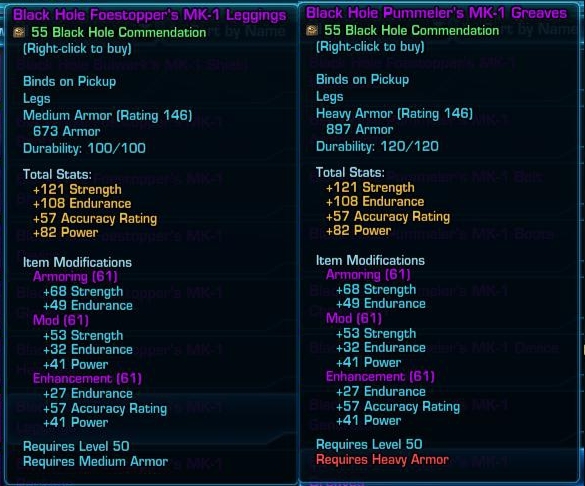 TL;DR – For the best armoring, mods, and enhancements for your stuff, you will probably want to mix and match between the foestopper (medium) and pummeler (heavy) sets – and obviously strip the mods on the pieces that aren’t the right armor class. And then, after you’re all geared up, and just ROLLING in BH comms, you can buy specific pieces just for one mod or enhancement to further tweak your set. Now, I should warn you, I’ve been trying like a fiend to find an actual GUIDE on the mixing-matching for sentinels. A friend in-game mentioned such a guide for sages, but I can’t seem to google up a specific BH/Rakata gearing strategy. So I’m using my own personal judgment here which, of course, is a dangerous thing. Boots. The foestopper boots are so awesome, I just want to clone all the components and use them for all the slots. I will have to buy a LOT of these and rip the mods and enhancements out. Sigh. Pants – Exactly the same. If you don’t need to shed accuracy, the enhancement on this piece is nice to use in just about any piece. Earpiece – For this, you’ll want to look at secondary stats and see which will serve you better, depending on your relevant soft caps and what the rest of your gear looks like. is, of course, to choose the piece with the higher strength value for MOAR DPS. All strength ALL THE TIME! Undecided on ear. Will probably buy that last and see what stats my overall set needs. Well first, I buy the armor that is better itemized for each slot. Period. Then, figure out whether to use ALL THE MODS from the BH stuff or keep some rakata bits that may be better itemized. Armoring– I will use the BH one. Some of the rakata mods have more strength than the BH mods (61 versus 53) – but an 8 point strength loss may be negligible compared to the secondary stats on those BH mods. Most of the BH mods have 41 crit (yuck), and I’m already hitting diminishing returns (and I suspect everyone else is too at that gear level). 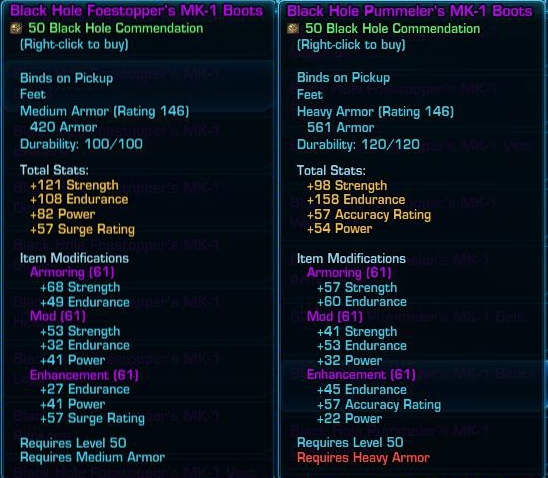 But the foestopper boots and foestopper/pummeler pants have 41 power…. Enhancement – probably use the BH one too. I badly need to shed some accuracy and grab some surge. Again, I could do without more crit. It depends as I get close to the end of my gear set what my stats look like. 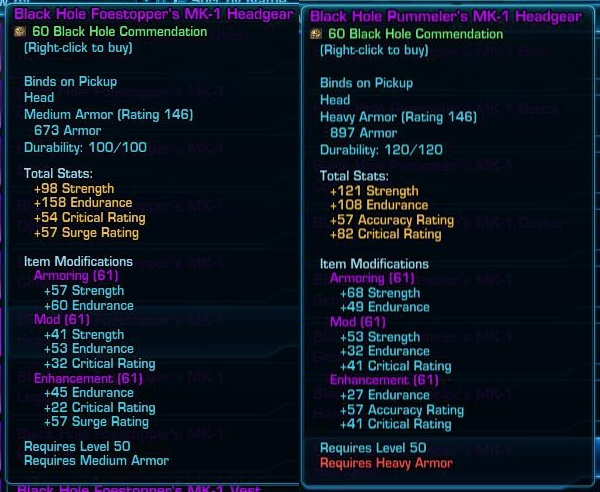 When ROLLING IN COMMS, buy extra armor pieces and replace individual mods. Advanced Adept Enhancement 26, found in the foestopper boots is really well itemized enhancement with power/surge. I will buy extras of those if I have comms to spare later… and if I still need to shed accuracy. Another option for swapping around is Advanced Initiative Enhancement 26 from the the foestopper/pummeler pants with accuracy and power. Expensive, but depends on what you need for caps and whatnot. Just watch as I derp – I’ll stack so much strength and ignore endurance – and then a strong wind will blow over the intrepid jedi. I think I need a spreadsheet. I ran a random ops finder last night just for the BH comms because, after I figured this all out, I actually want the BH gear. It was… interesting. We got to make fun of other people, though, so guild bonding ftw?